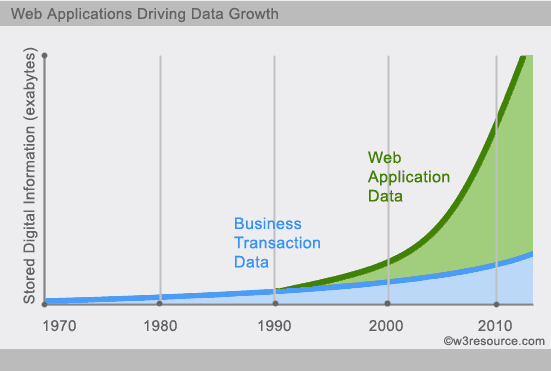 In the computing system (web and business applications), there are enormous data that comes out every day from the web. A large section of these data is handled by Relational database management systems (RDBMS). The idea of relational model came with E.F.Codd’s 1970 paper "A relational model of data for large shared data banks" which made data modeling and application programming much easier. Beyond the intended benefits, the relational model is well-suited to client-server programming and today it is predominant technology for storing structured data in web and business applications. A database transaction, must be atomic, consistent, isolated and durable. Below we have discussed these four points. A distributed system consists of multiple computers and software components that communicate through a computer network (a local network or by a wide area network). A distributed system can consist of any number of possible configurations, such as mainframes, workstations, personal computers, and so on.The computers interact with each other and share the resources of the system to achieve a common goal. The important advantage of distributed computing system is reliability. If some of the machines within the system crash, the rest of the computers remain unaffected and work does not stop. In distributed computing the system can easily be expanded by adding more machines as needed. Shared data is essential to many applications such as banking, reservation system. As data or resources are shared in distributed system, other resources can be also shared (e.g. expensive printers). As the system is very flexible, it is very easy to install, implement and debug new services. A distributed computing system can have more computing power and it's speed makes it different than other systems. As it is open system, every service is equally accessible to every client i.e. local or remote. The collection of processors in the system can provide higher performance (and better price/performance ratio) than a centralized computer. Less software support is the main disadvantage of distributed computing system. The network infrastructure can create several problems such as transmission problem, overloading, loss of messages. In electronics (including hardware, communication and software), scalability is the ability of a system to expand to meet your business needs. For example scaling a web application is all about allowing more people to use your application. You scale a system by upgrading the existing hardware without changing much of the application or by adding extra hardware. To scale vertically (or scale up) means to add resources within the same logical unit to increase capacity. For example to add CPUs to an existing server, increase memory in the system or expanding storage by adding hard drive. To scale horizontally (or scale out) means to add more nodes to a system, such as adding a new computer to a distributed software application. In NoSQL system, data store can be much faster as it takes advantage of “scaling out” which means to add more nodes to a system and distribute the load over those nodes. NoSQL is a non-relational database management systems, different from traditional relational database management systems in some significant ways. It is designed for distributed data stores where very large scale of data storing needs (for example Google or Facebook which collects terabits of data every day for their users). These type of data storing may not require fixed schema, avoid join operations and typically scale horizontally. In today’s time data is becoming easier to access and capture through third parties such as Facebook, Google+ and others. Personal user information, social graphs, geo location data, user-generated content and machine logging data are just a few examples where the data has been increasing exponentially. To avail the above service properly, it is required to process huge amount of data. Which SQL databases were never designed. 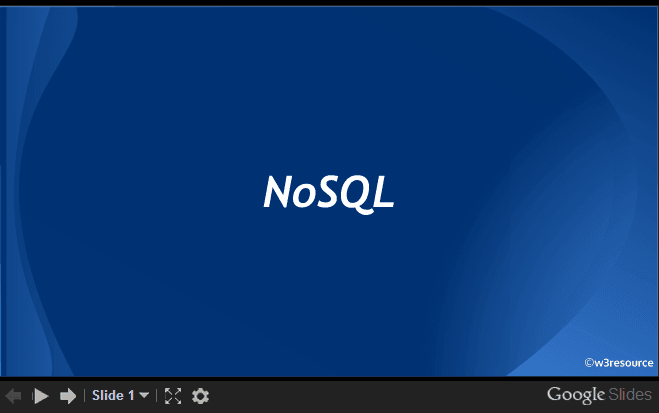 The evolution of NoSql databases is to handle these huge data properly. - Data and its relationships are stored in separate tables. The term NoSQL was coined by Carlo Strozzi in the year 1998. He used this term to name his Open Source, Light Weight, DataBase which did not have an SQL interface. In the early 2009, when last.fm wanted to organize an event on open-source distributed databases, Eric Evans, a Rackspace employee, reused the term to refer databases which are non-relational, distributed, and does not conform to atomicity, consistency, isolation, durability - four obvious features of traditional relational database systems. In the same year, the "no:sql(east)" conference held in Atlanta, USA, NoSQL was discussed and debated a lot. And then, discussion and practice of NoSQL got a momentum, and NoSQL saw an unprecedented growth. 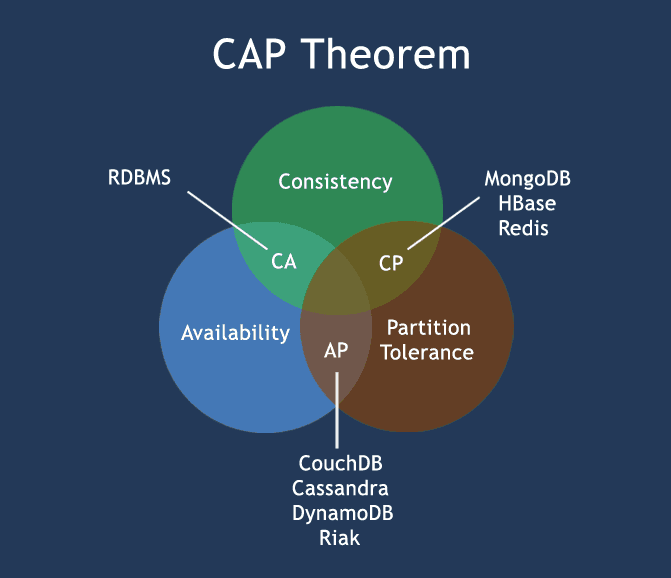 You must understand the CAP theorem when you talk about NoSQL databases or in fact when designing any distributed system. CAP theorem states that there are three basic requirements which exist in a special relation when designing applications for a distributed architecture. Consistency - This means that the data in the database remains consistent after the execution of an operation. For example after an update operation all clients see the same data. Availability - This means that the system is always on (service guarantee availability), no downtime. Partition Tolerance - This means that the system continues to function even the communication among the servers is unreliable, i.e. the servers may be partitioned into multiple groups that cannot communicate with one another. CA - Single site cluster, therefore all nodes are always in contact. When a partition occurs, the system blocks. CP -Some data may not be accessible, but the rest is still consistent/accurate. AP - System is still available under partitioning, but some of the data returned may be inaccurate. A BASE system gives up on consistency. Key-value stores are most basic types of NoSQL databases. Designed to handle huge amounts of data. Based on Amazon’s Dynamo paper. Key value stores allow developer to store schema-less data. In the key-value storage, database stores data as hash table where each key is unique and the value can be string, JSON, BLOB (Binary Large OBjec) etc. A key may be strings, hashes, lists, sets, sorted sets and values are stored against these keys. For example a key-value pair might consist of a key like "Name" that is associated with a value like "Robin". 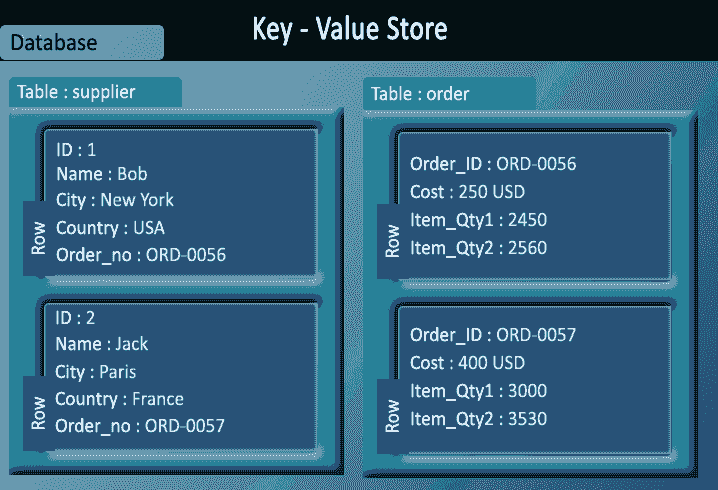 Key-Value stores can be used as collections, dictionaries, associative arrays etc. Key-Value stores follow the 'Availability' and 'Partition' aspects of CAP theorem. Key-Values stores would work well for shopping cart contents, or individual values like color schemes, a landing page URI, or a default account number. Example of Key-value store DataBase : Redis, Dynamo, Riak. etc. 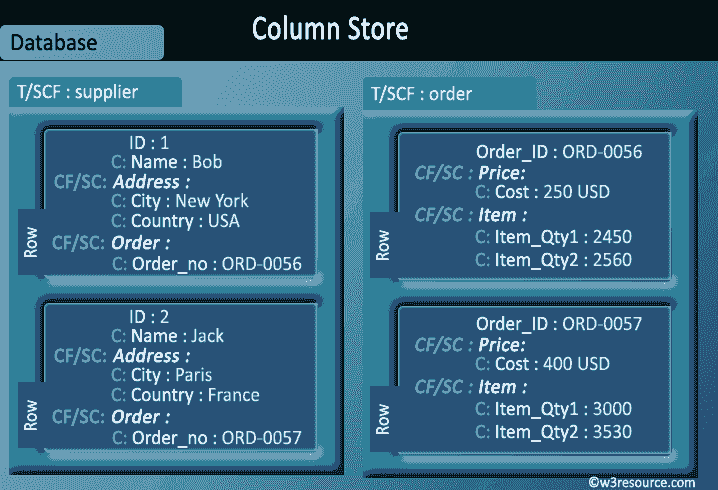 Column-oriented databases primarily work on columns and every column is treated individually. Values of a single column are stored contiguously. Column stores data in column specific files. In Column stores, query processors work on columns too. All data within each column datafile have the same type which makes it ideal for compression. Column stores can improve the performance of queries as it can access specific column data. High performance on aggregation queries (e.g. COUNT, SUM, AVG, MIN, MAX). Works on data warehouses and business intelligence, customer relationship management (CRM), Library card catalogs etc. 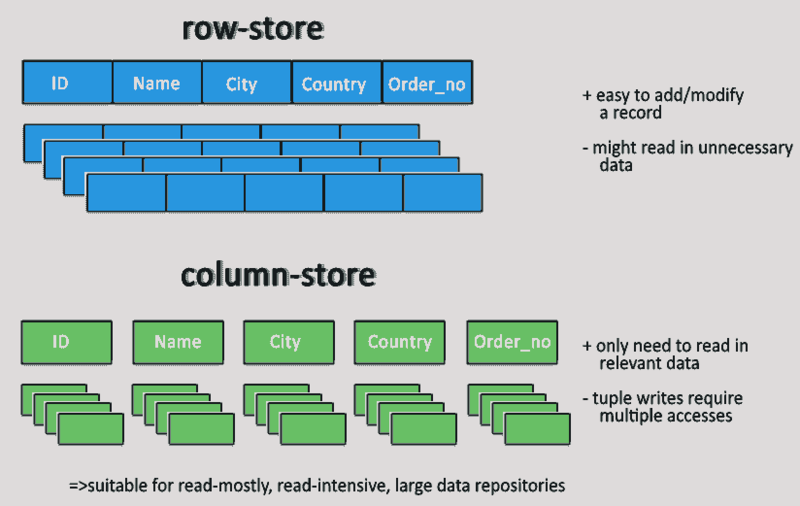 Example of Column-oriented databases : BigTable, Cassandra, SimpleDB etc. A graph data structure consists of a finite (and possibly mutable) set of ordered pairs, called edges or arcs, of certain entities called nodes or vertices. The following picture presents a labeled graph of 6 vertices and 7 edges. 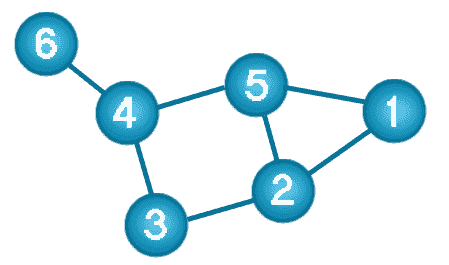 What is a Graph Databases? 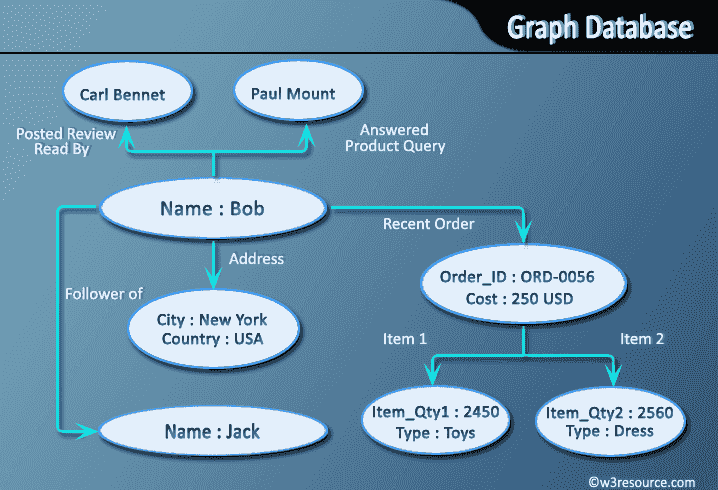 A graph database stores data in a graph. It is capable of elegantly representing any kind of data in a highly accessible way. Each node represents an entity (such as a student or business) and each edge represents a connection or relationship between two nodes. Every node and edge are defined by a unique identifier. Each node knows its adjacent nodes. As the number of nodes increases, the cost of a local step (or hop) remains the same. Example of Graph databases : OrientDB, Neo4J, Titan.etc. Data in this model is stored inside documents. A document is a key value collection where the key allows access to its value. Documents are not typically forced to have a schema and therefore are flexible and easy to change. Documents are stored into collections in order to group different kinds of data. Documents can contain many different key-value pairs, or key-array pairs, or even nested documents. 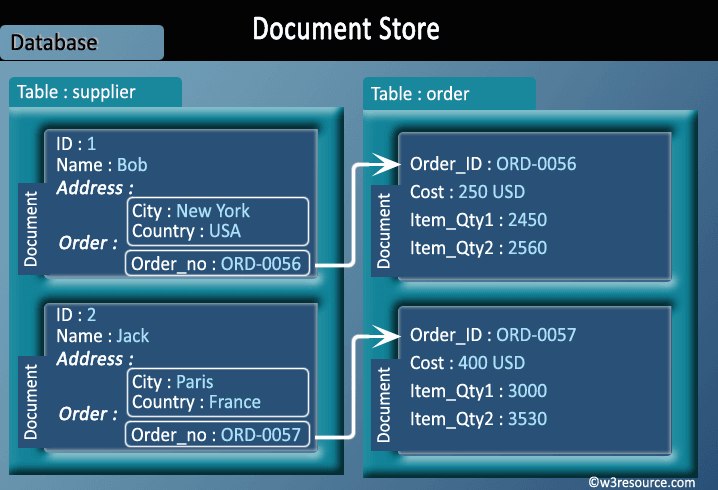 Example of Document Oriented databases : MongoDB, CouchDB etc.